SUNSET BEACH, N.C.(WFMY) - Some stories are so good they almost feel like a fairytale, like something out of a storybook. Back in April, a little French girl put a message in a bottle and dropped it into the Atlantic Ocean, while on a cruise from the Caribbean to the Canary islands. That bottle traveled all the way across the ocean and lands in North Carolina 5 months later in the aftermath of Hurricane Florence. 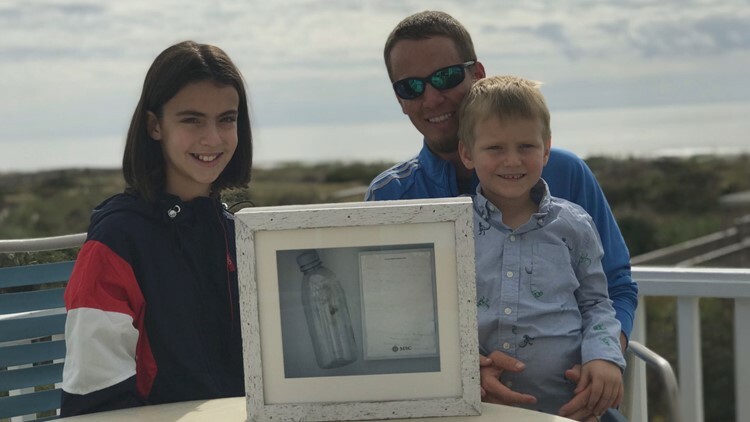 12-year-old Ambre Dorange sent her message in a bottle off into the ocean, with a glimmer of hope that someone would find it. She wrote her email in the note and asked anyone who found it to contact her. Amazingly, Jake Wilson and his five-year-old son recovered the bottle while searching through debris on Sunset Beach. "I said to my son Blake, I said, you know you have to check these bottles because one of them could have a message in it. And I honestly only walked about ten feet and it was like five seconds after I said that, the bottle was laying right there on the beach," said Wilson. Although it was tough for Wilson to read the note after it's long journey, he could make out Ambre's email. He contacted her and just this week, she flew all the way to Sunset Beach to meet him. "Her mom told me that she was very excited, wanted to call every family member and tell them that someone found the bottle and she, it was very hard for her to go to sleep that night, " said Wilson. While Hurricane Florence was devastating to our state, it brought together two families that wouldn't have met otherwise. "We've been having a great time. It's just amazing that people will make a journey all the way across the Atlantic and you know something as simple as this bottle, you know, can bring people together," said Wilson. This unlikely friendship won't end when Ambre goes home. Wilson said his family plans to visit Ambre and her family in France sometime in the future.